Filters are avoided through the use of an unique cyclone collector fitted inside the hopper loader. Mechanical flaps are fitted to both the material inlet and discharge ports. Cleaning is via an easy access door fitted with a filter cartridge. 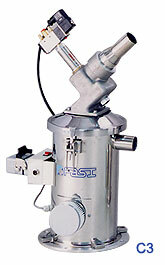 Optional intermediate hoppers can be fitted to the base enabling the unit to be mounted onto the machine feed throat. 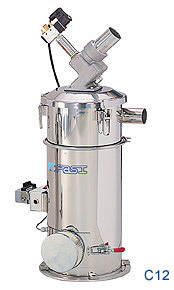 Available hopper sizes are 3,6,12,25,50,75, and 100 litres. This series is fitted with a plexi-glass material chamber with a proximity switch to sense the material level, together with non-return flap valves on both the material inlet and discharge prots. This series of hopper loader is particularly suitable for mounting directly onto the machine feed throat. available hopper sizes are 3, 6 litres. Featuring a Mitsubishi fully programmable controller operated via a touch screen. 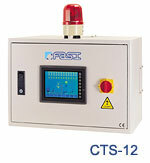 The system will handle up to 12 stations, with the opional extension CTS-12E for up to 24 stations. This new range of controller uses a colour graphic screen giving high speed access and system response to its easy to follow system function settings, on screen manuals and self diagnosis for fault finding. All on-line operating instructions and maintenance guides are also contained, accessed and viewed on the controller screen. 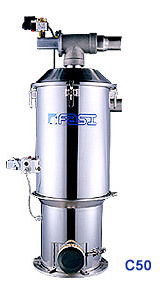 High efficiency units whose features include a built-in conical filter with approx. 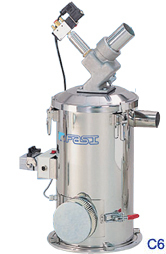 1.6m2 filtering surface, automatic filter cleaning function, easy access door with air filter and dust collection container with sight-glass.